IP Newton B. Jones reviews M.O.R.E. WORK Investment Fund. Mark Garrett, Director of Health and Safety Services, updated attendees on two new OSHA standards concerning crystalline silica and beryllium. Tim Simmons, Director of National Recruitment Services, explains updates to the MBDS and referral rules. WESTERN STATES SECTION membership has climbed to 2,550, up from 1,983 in 2017. 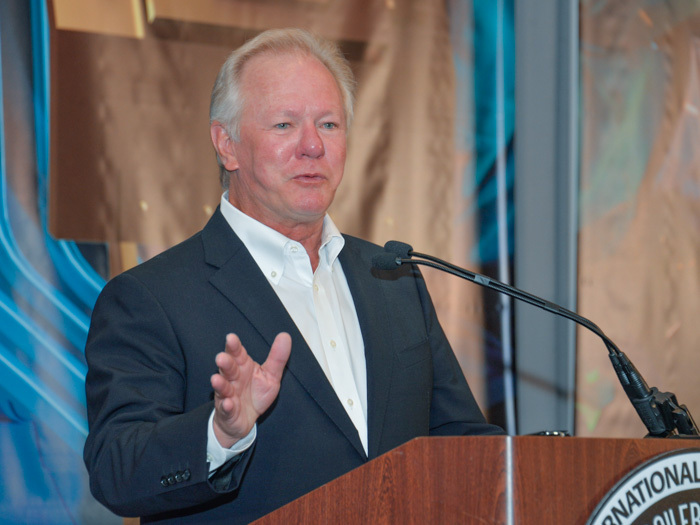 That was good news shared during the 2019 Construction Sector Operations Conference March 4-7, where membership numbers, manhours, safety and the M.O.R.E. Work Investment Fund were key topics. While numbers in the Western States are encouraging, membership and man-hour trends in other areas, however, make it clear that more needs to be done. The 2019 conference focused on updates and solutions to recruit new members, organize new local lodges, build employment opportunities and grow man-hours. “We have a lot to do in this organization, and we’re going to have to change how we do some things,” International President Newton B. Jones challenged the audience of CSO business managers and guests “We can change the way we think about our work. We can change the way we think about our jurisdiction. Reaching out to potential Boilermaker employers through new marketing efforts. Restarting the “Fight Back” construction organizing campaigns and additional organizing programs. Recruiting skilled craft workers to replace those who have left or retired, allowing projects to be fully staffed and increasing man-hours. Implementing work recovery programs and new employment initiatives. Another way to bring more work to Boilermakers is through legislation. IP Jones explained that membership and man-hour gains in the Western States are largely due to the passage of refinery safety legislation Senate Bill 54, enacted into California law in 2014. Championed by Boilermakers, the law requires at least 60 percent of journeymen working in refineries to have graduated from an approved apprenticeship training program. 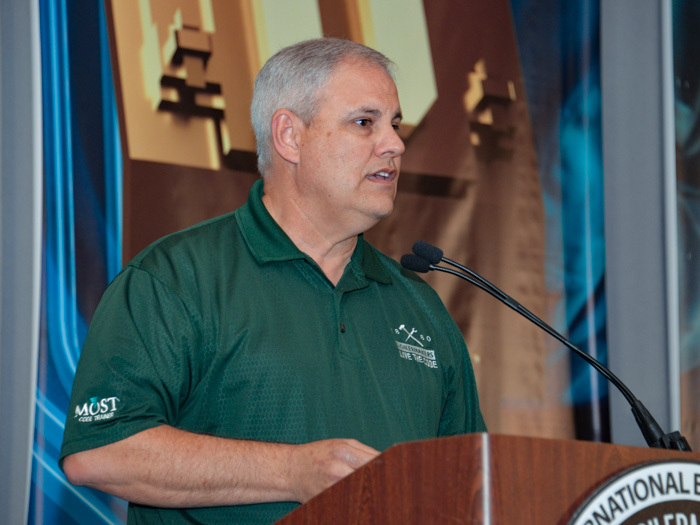 International Vice President-Western States, J. Tom Baca, noted that SB 54 has brought in about 3 million more Boilermaker man-hours in California. Following on that success, the International is supporting comparable legislation in Washington State and is looking at similar opportunities in additional states. “The M.O.R.E. Work Investment Fund provides us the resources we need to be able to do that,” said IP Jones, noting support required for lobbying and outreach activities similar to those used to pass SB 54. The M.O.R.E. Work Investment Fund will also focus on job targeting and recovery agreements: unionizing companies and industries where there has never been a Boilermaker presence and reestablishing the union at companies and industries where the Boilermakers have lost ground. IP Jones said that beyond relying on the large-scale refinery and power generation industries for work, new opportunities will be sought in any capacity, including cement and steel mill industries, garbage burners and more. In addition to progress with the M.O.R.E. Work Investment Fund, President Jones announced another initiative to increase membership by recruiting prospective Boilermakers through a National Transient District Lodge based in Hendersonville, Tennessee. President Jones explained there will be four National Transient Local Lodges established— one in each U.S. Vice Presidential section, and all under a district “umbrella” in Hendersonville. Each section will have a training center associated with its new National Transient Local Lodge. CSO PARTICIPANTS GOT a sneak preview of an updated Boilermakers website in development and new marketing materials. The new website is scheduled to launch in time for the National Tripartite Alliance meeting in August. Using new technology and industry visual standards, the overall website will be easier to navigate and optimized for mobile. Among the new features planned will be industry-specific pages and an online marketing toolkit. The marketing toolkit will include ads, brochures and promotional materials that are ready to use “as is,” materials that can be customized for a specific local or project, an array of social media graphics, a new PowerPoint template, many other marketing resources and a form to request materials not available in the toolkit. 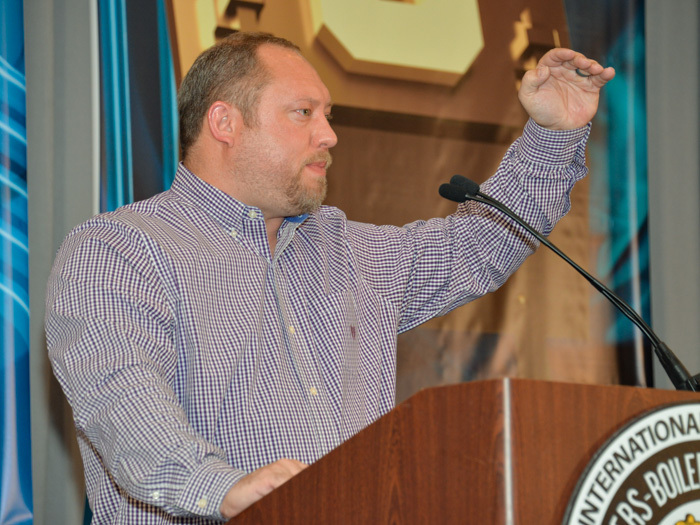 “As business managers and other leaders think about marketing the Boilermakers to owners, contractors, prospective members, apprentices and others, we want to make it as easy as possible for them to have the materials they need to be successful,” Wiser said. 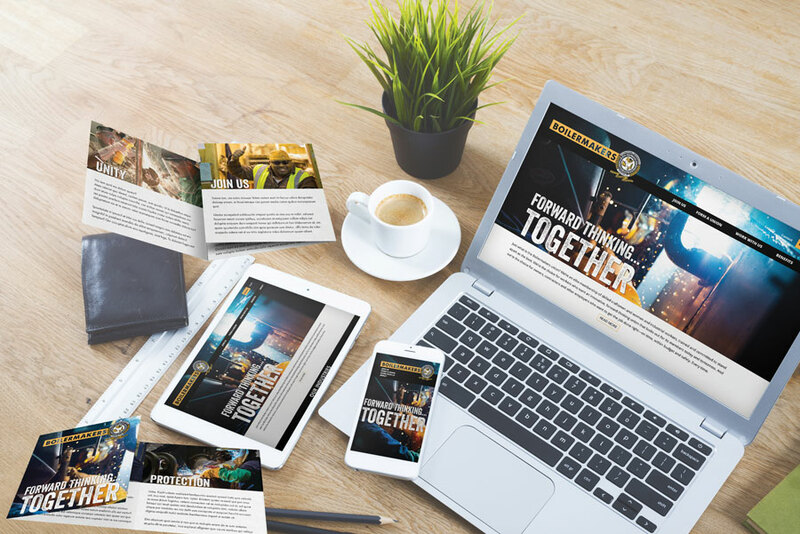 Marketing materials are in development and will be loaded into the new marketing toolkit when it launches. MARK GARRETT, DIRECTOR of Health and Safety Services, updated attendees on two new Occupational Safety and Health Administration (OSHA) standards that will protect Boilermakers and others from potentially fatal disease. The first pertains to crystalline silica — a known carcinogen found in sand, stone and artificial stone. It’s a key raw material that has been used for thousands of years and can be found in millions of products, from concrete to paint, cosmetics to medication, computers to cars. Breathing silica dust can trigger silicosis, a chronic disease that involves scarring of the lungs. The new OSHA silica standard lowers the permissible exposure limit (PEL) for respirable crystalline silica for all industries to 50 micrograms per cubic meter of air averaged during an 8-hour shift — down from 250 micrograms. OSHA estimates that 2.3 million workers are exposed to the dust, including 2 million in construction. The standard is especially critical for members in the cement industry or who perform sandblasting as part of their job. General industry and maritime workplaces have until June 23, 2019, to comply with the new rule. The second standard applies to beryllium, a strong, light-weight chemical element commonly used as an alloy with other metals to make them more resilient. Classified as a strategic and critical material by the U.S. Department of Defense, beryllium exposure can cause potentially life-threatening immunological lung disease. The new standard establishes a PEL of 0.2 micrograms of beryllium per cubic meter of air averaged over eight hours. According to OSHA, about 62,000 workers are exposed to beryllium in their workplaces. Of those, approximately 11,500 construction and shipyard workers may conduct abrasive blasting operations using slags that contain trace amounts of beryllium. OSHA began enforcing all provisions of the beryllium standard for general industry on December 12, 2018. Email and dashboard notifications 30 days prior to drug test expiration date. Email and dashboard notifications 60 days prior OSHA 10 safety training expiration date. Ability to add or modify email addresses. Business managers will have the ability to track the number of welders by skill level. Said posting shall serve as notice to all referral agents operating an exclusive referral procedure, pursuant to these Uniform Referral Standards and Joint Referral Rules, that the applicant shall not be referred for the duration of the penalty.